Near Kyoto Brighton Hotel and Imperial Palace. we will welcome you with japanese traditional Shiatsu massage. 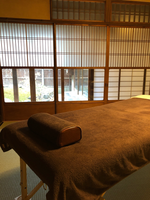 HealthTrail Massage Room enhances the vitality of your mind and body through traditional Shiatsu massage of Japan. 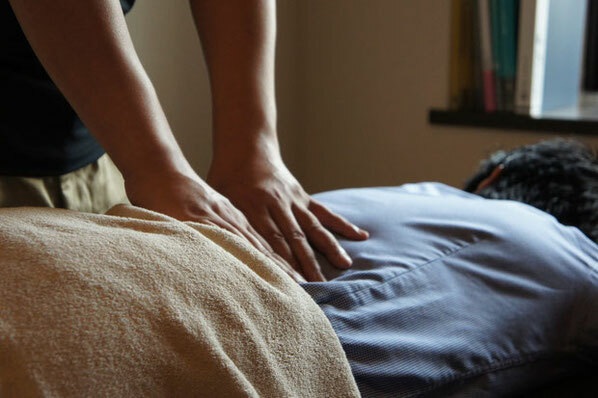 Shiatsu massage removes the fatigue substance and regains blood flow to muscles muscles. It also frees the nerve from oppression of muscles by softening hard muscles. In Oriental medicine, mind and body are considered as a whole. Keeping condition of your body is to keep your mind health and happy! Please make a reservation if it is possible by the day before you would like to have massage. Please write either in English or Japanese. In this course, our massage firmly reaches to your body. We recommend this course to people under daily pain especially people with back pain or pain shoulders. For hard working people and for those with fatigue, if you have serious pain or want your whole body to be fully relaxed, this is the course we recommend. In this course, we will take the finest care of your body with a reasonable price. Our therapist treats your whole body to improve bad condition of your body . Therapist finds your problem and follows it until fixed. I'm sure you will be very satisfied. "You do not have to take off your clothes when being massaged. However we recommend you to wear a comfortable clothes." "Please note we give massage one by one and do not offer two persons massage simultaneously." "Please also note we accept cash only." For your reservation, please send us an e-mail at least one day before your massage. Please include the course (60min, 90min, 120min), name, date and time, and your contact e-mail address. We will contact you upon receiving your reservation. Business hours: 11: 00am-8: 00pm (Irregular holidays). Nice to meet you. My name is Tai.I am in charge of the treatment. 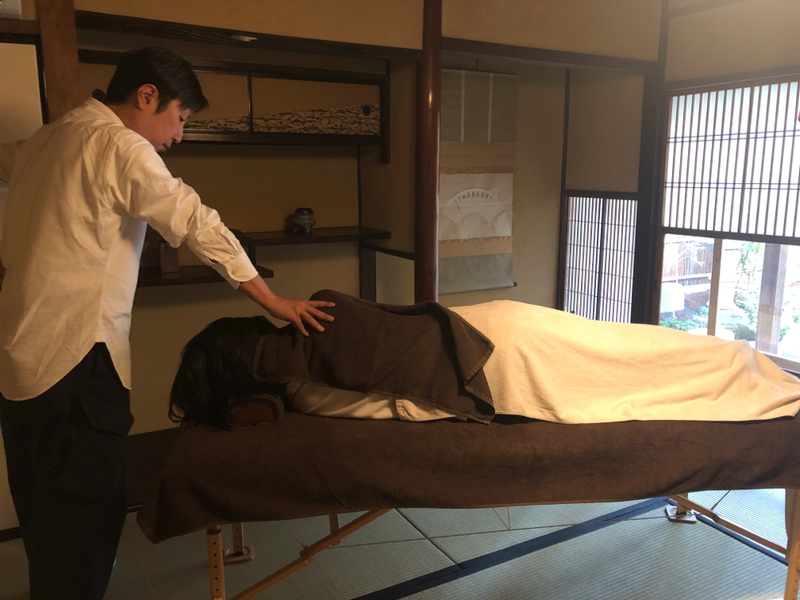 Did you know that visually impaired person is involved in shiatsu massage more than 400 years in Japan?Because the visually impaired person’s fingertips are sensitive, so they will be able to know the trouble of the body to a more accurate. Now we have the person who engaged in the work of Shiatsu even if there is no impaired vision, but visually impaired person has a lot working even now. And similarly, I am also a visually impaired person. Moreover, I have a national qualification of Shiatsu massage.To obtain this qualification, requires study and training of more than three years.It is difficult to take the qualification, so people who have qualified are few.If you are going to receive treatment in Japan, it is recommended that you confirm the presence or absence of a national qualification for safety. And I hope everyone around the world to experience my shiatsu massage to become a smile. I am welcome you in my skills and my sincerity.We are looking forward to welcoming everyone. 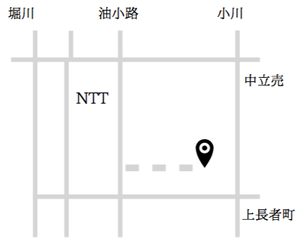 A 5-minute walk from the city bus Horikawa Nakadachiuri Station. If taxi, please tell the driver as 「油小路上長者町上る東側」 "Aburanokouji Kamichoujamachi agaru higashigawa". It is close to Kyoto Brighton Hotel and the Imperial Palace!